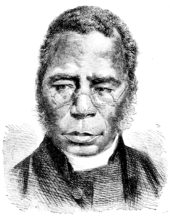 Samuel Ajayi Crowther (c. 1809–31 December 1891) was a linguist and the first African Anglican bishop in Nigeria. Born in Osogun (in what is now Iseyin Local Government, Oyo State, Nigeria), Crowther was a Yoruba who also identified with Sierra Leone's ascendant Creole ethnic group. Crowther, whose name Samuel Ajayi Crowther adopted, by Thomson 1828. Ajayi was 12 years old when he was captured, along with his mother and toddler brother and other family members, along with his entire village, by Muslim Fulani slave raiders in 1821 and sold to Portuguese slave traders. However, before his slave-ship left port, it was boarded by a British Royal Navy ship under the command of Captain Henry Leeke, and Crowther was taken to Freetown, Sierra Leone, where he was released. Ajayi's mother was a descendant of King Abiodun. While in Sierra Leone Crowther was cared for by the Anglican Church Missionary Society and was taught English. He converted to Christianity. On 11 December 1825 was baptized and he named himself after the vicar of Christ Church, Newgate, London - Samuel Crowther, who was one of the pioneers of the CMS. Ajayi was baptized by John Raban. While in Freetown, Crowther became interested in languages. In 1826 he was taken to England to attend St Mary's Church in Islington and the church's school. He returned to Freetown in 1827 and attended, as the first student, the newly opened Fourah Bay College, an Anglican missionary school, where his interest in language found him studying Latin and Greek but also Temne. After completing his studies he began teaching at the school. He married a schoolmistress, Asano (i.e. Hassana; she was formerly Muslim), baptised Susan. She was also rescued from the Portuguese slave ship that originally brought Crowther to Sierra Leone, and had also converted to Christianity. Their several children included Dandeson Coates Crowther, archdeacon of the Niger Delta. Crowther was father-in-law to Thomas Babington Macaulay, a junior associate, who married Crowther's 2nd daughter (Abigail Crowther). Crowther's grandson Herbert Macaulay (Thomas Babington Macaulay and Abigail Crowther's son) became one of the first Nigerian nationalists and played an important role in ending British colonial rule in Nigeria. Crowther was also a close associate and friend of Captain James Pinson Labulo Davies, an influential politician, mariner, philanthropist and industrialist in colonial Lagos. Both men collaborated on a couple of Lagos social initiatives such as the opening of The Academy (a social and cultural center for public enlightenment) on 24 October 1866 with Crowther as the 1st patron and Captain J.P.L Davies as 1st president. Crowther was selected to accompany the missionary James Schön on the Niger expedition of 1841. Together with Schön, he was expected to learn Hausa for use on the expedition. The goal of the expedition was to spread commerce, teach agricultural techniques, spread Christianity, and help end the slave trade. Following the expedition, Crowther was recalled to England, where he was trained as a minister and ordained by the Bishop of London. This after Schön had written to the Church Missionary Society noting Crowther's usefulness and ability on the expedition, recommending them to prepare him for ordination. He returned to Africa in 1843 and with Henry Townsend, opened a mission in Abeokuta, in today's Ogun State, Nigeria. Crowther began translating the Bible into the Yoruba language and compiling a Yoruba dictionary. In 1843, a grammar book which he started working on during the Niger expedition was published; and a Yoruba version of the Anglican Book of Common Prayer followed later. Crowther also compiled A vocabulary of the Yoruba language, including a large number of local proverbs, published in London in 1852. He also began codifying other languages. Following the British Niger Expeditions of 1854 and 1857, Crowther, assisted by a young Igbo interpreter named Simon Jonas, produced a primer for the Igbo language in 1857, another for the Nupe language in 1860, and a full grammar and vocabulary of Nupe in 1864. In 1864, Crowther was ordained as the first African bishop of the Anglican Church; he was consecrated a bishop on St Peter's day 1864, by Charles Longley, Archbishop of Canterbury at Canterbury Cathedral. He later received the degree of Doctor of Divinity from the University of Oxford. Crowther was on the island of Madeira in the Atlantic Ocean west of Morocco for a conference. He was accompanied by his son, Dandeson, an archdeacon, on church business in March 1881. Crowther's attention was directed more and more to languages other than Yoruba, but he continued to supervise the translation of the Yoruba Bible (Bibeli Mimọ), which was completed in the mid-1880s, a few years before his death. Crowther is celebrated with a feast on the liturgical calendar of some Anglican churches, including the Episcopal Church (United States) and the Church of Nigeria, on 31 December. Crowther died of a stroke, in Lagos, on 31 December 1891 and was buried at Ajele Cemetery in Lagos. In 1971 the Lagos State Government under Mobolaji Johnson desired to use the site of Ajele Cemetery for new government offices and issued notices to families of the deceased. Seth Kale, Anglican Bishop of Lagos, representing the Anglican community and Crowther's family delayed exhumation and reburial until 1976 when an elaborate ceremony was held at a new burial site along with a cenotaph at Cathedral Church of Christ, Lagos. ^ Jacob Oluwatayo Adeuyan (2011). The Journey of the First Black Bishop: Bishop Samuel Ajayi Crowther 1806-1891. AuthorHouse. p. 70. ISBN 9781463407322. ^ Toyin Falola; Aribidesi Adisa Usman (2009). Movements, Borders and Identities in Africa (Volume 40 of Rochester studies in African history and the diaspora). University Rochester Press. p. 67. ISBN 9781580462969. ISSN 1092-5228. ^ Herskovits Kopytoff, Jean. A Preface to Modern Nigeria: The "Sierra Leonians" in Yoruba, 1830-1890. University of Wisconsin Press. p. 35. ^ a b c Buckland 1901. ^ "Macaulay, Thomas Babington 1826 to 1878 Anglican Nigeria". Dictionary for African Christian Biography. Archived from the original on 19 August 2014. Retrieved 23 January 2015. ^ Elebute, Adeyemo. The Life of James Pinson Labulo Davies: A Colossus of Victorian Lagos. Kachifo Limited/Prestige. p. 169. ISBN 9789785205763. ^ Adedeji, J.A. The Church and the Emergence of the Nigerian Theatre, 1866-1914. Journal of Historical Society of Nigeria.6.1. p. 228. ^ Page 1888, p. 64. ^ Oluniyi, Olufemi Olayinka (2017). Reconciliation in Northern Nigeria: The Space for Public Apology. Frontier Press. ISBN 9789789495276. ^ "Crowther awaits reburial". The Nigeria Nostaligia Project 1960-1980 on Facebook. Daily Times of Nigeria 1971. Retrieved 23 January 2015. ^ Ukeh & Anokwuru. "83 year old Orewande Januario". NBF News. Retrieved 23 January 2015. "Crowther, Samuel Ajayi, Nigeria, Anglican". Dictionary of African Christian Biography. Archived from the original on 11 July 2014. Retrieved 1 September 2014. Page, Jesse (1888). Samuel Crowther: The Slave Boy who Became Bishop of the Niger. New York: Fleming H. Revell Company. p. 64. Retrieved 12 April 2015. Hair, Paul Edward Hedley (1967). "The Early Study of Yoruba, 1825-1850". The early study of Nigerian languages. Cambridge U. P. in association with the West African Languages Survey and the Institute of African Studies, Ibadan. Page, Jesse (1892). Samuel Crowther: The Slave Boy who Became Bishop of the Niger. New York: Fleming H. Revell Company. Buckland, Augustus Robert (1901). "Crowther, Samuel Adjai" . Dictionary of National Biography (1st supplement). London: Smith, Elder & Co.
Childe, A F. (1852). Good out of evil, or, The history of Adjai. London: Wertheim and MacIntosh. Noll, Mark A. (2009). The New Shape of World Christianity: How American Experience Reflects Global Faith. InterVarsity Press. ISBN 978-0-8308-2847-0. Lewis, Donald M. (2004). Christianity Reborn: The Global Expansion of Evangelicalism in the Twentieth Century. Wm. B. Eerdmans Publishing. ISBN 978-0-8028-2483-7. Crowther, Samuel Adjai (1900). Bibeli Mimọ Tabi Majẹmu Lailai Ati Titun. (Holy Bible in Yoruba.). London. Crowther, Samuel Ajayi; Vidal, Owen Emeric (1852). A Vocabulary of the Yoruba language, Together with Introductory Remarks by the Rev. OE Vidal. London: Seeleys. This page was last edited on 19 April 2019, at 03:41 (UTC).